Josephine wrote me an email one month before she and her hubby Adrian were to leave their native Singapore for their Honeymoon trip to Europe. She was interested in booking me for a Honeymoon Session in Florence, and wanted to know about my fees and packages. She came across as a very nice person throughout the numerous emails we exchanged while finalizing details, so I was looking forward to meeting her and her husband Adrian in Florence. We met at my favorite coffee shop bar at the Piazza del Duomo, and embarked on our FUN-filled mini-tour of Florence right away. They were a bit shy for about the first 3 minutes, but quickly became relaxed in front of the lens. I must say this was one of my favorite shoots so far, with some of the most beautiful imagery I’ve created yet, which consequently inspired me to push my post-production to another level, so I hope you guys enjoy them. The intricate colors and architecture of the Duomo is just mind-blowing.. Love! Josephine was very playful and fun during the shoot and helped Adrian to feel more relaxed.. I just had to put them up on the Merry-Go-Round! 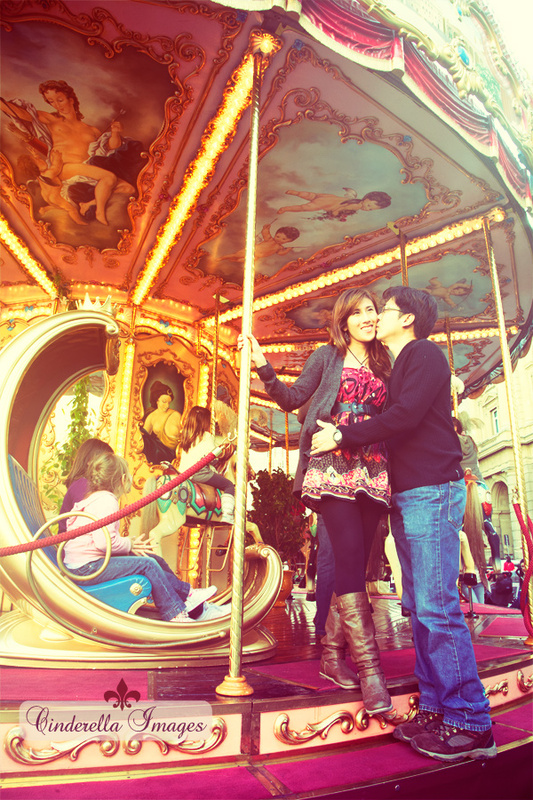 What’s a Florence Honeymoon Session without an opulent and antique Merry-Go-Round? They blended in beautifully in any background I put them in. :) A photographer’s dream..
Admiring the “street art” on the way to the Ponte Vecchio. They were even nice enough to tip the artists! Of course I had to take them to rub the Pig’s nose for good luck and to insure a return visit! Going in for a kiss, one of many..
One of the many gorgeous antique doors in Florence.. Taking in the sites near the famous Ponte Vecchio, or Old Bridge, where gold jewelry merchants still sell their goods to this day. The hallway inside the top part of the building was once used by the Medici family as a “private” passage when they wanted to avoid the droves of people down below. Florence is full of charm, and this gorgeous corner with the antique worn-down steps, beautiful door and pretty balcony fit for Juliet, of “Romeo and Juliet” fame, is no exception..
Another one of my favorite shots.. I have many favorites from this Honeymoon Session. :) I just love the whole shoot! Checking out the back of Pitti Palace, the main seat of the Medici family’s grand dukes, located inside the Boboli Gardens.. Taking in the architectural beauty of the Palazzo Piti..
A sweet kiss near one of many statues at Boboli Gardens..
Four hours had already flown by and the sun was beginning to set..
Italy inspires romance, and Florence is no exception..
Good luck to our newlyweds and hope to see you guys again one day in the near future in bellissima Italia! All images are copyright © 2011-2017 Anna Nersesyan Photography - Cinderella Images - Italy Wedding Photographer - Rome Wedding Photographer - Amalfi Coast Wedding Photographer - Venice Tuscany Wedding Photographer - Italy Destination Wedding Photographer - info@cinderellaimages.com |ProPhoto5 WordPress Theme by NetRivet, Inc.